The Fine Art of Pastels is a juried exhibition meant to highlight both the demanding technical aspects and the lively spirit inherent in this popular medium. Entries will be accepted from throughout the United States. The exhibition will be juried by well-known pastel artist Terri Ford. More than 60 works will be included in the exhibition and will represent the very best images being created today. On view March 27 – May 26, 2019. The Calls for Entries for the two shows that will hang during the IAPS Convention are up now! They are accepting entries until February 1, 2019. The Prospectus for the 34th Juried Exhibition (for artists who have not yet received their IAPS Master Circle honor) can be viewed here: http://www.iapspastel.org/pdf/IAPS_34th.pdf. To enter this show, click here: http://www.showsubmit.com/sd_iaps34th.php. To enter this show, click here: http://www.showsubmit.com/sd_iaps5MC.php. For entry rules and how to enter, download the flyer here. "For the Beauty of the Earth 2018"
A juried show of representational fine art. This is our fourth year for this exhibition and we hope you will be a part of it. The goal of this exhibit is to rejoice in the beauty of our earth and to celebrate the artists who capture this beauty in their creative process. It is also to provide an opportunity for artists to display their work, and for the public to view and purchase the excellent plein air and studio pieces being produced by these fine artists. Artists and the public are invited to attend a special awards reception to be held at Riviera UMC on Sunday, October 14 at 3 p.m. at Riviera UMC, 375 Palos Verdes Blvd., Redondo Beach, CA. "For the Beauty of the Earth" is part of Riviera UMC's Rejoice in Art! Fine Art Fair and Exhibition, October 13-14, 2018. The Art Exhibiton continues though October 28th. Download the Call for Artists Flyer. An Online International Juried Exhibition of Pastel Paintings. 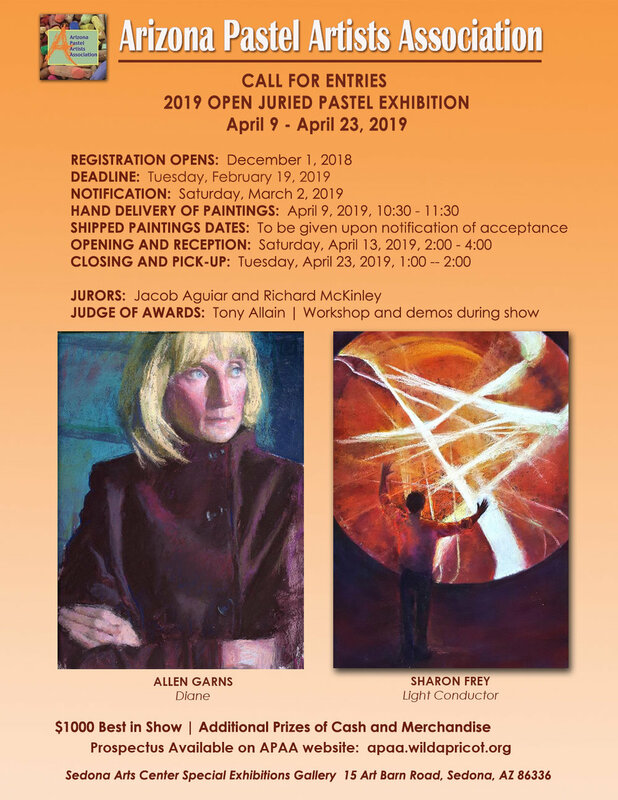 Sponsored by Pastel Journal, America’s leading magazine devoted to pastel artists, this annual competition offers cash, prizes and publicity to its talented winners. Get rewarded for your finest work! Winners will be featured in the April 2018 issue of Pastel Journal. A juried show of California coastal fine art. Cash prizes for Best of Show, 1st, 2nd, 3rd, and Honorable Mentions. To enter, go to www.onlinejuriedshows.com and select Rejoice in Art! “An Ocean View II” Open to all representational artists in any two-dimensional media, excluding photography. Opening Reception: October 14, 5-7 p.m. at Riviera UMC, 375 Palos Verdes Blvd., Redondo Beach, Calif.
UART would like to inform you that their 2016 Online Pastel Show is now open to pastel artists (dry pastels only), and will end on June 17, 2016 at 11:59 pm. All accepted pieces will be notified on June 28, 2016. All winners will be notified on July 7, 2016. CALL TO ARTISTS…. Enter SOON! $5,000 total in cash and merchandise will be awarded (with $1,000 of that for Best of Show). Entries open now through June 26, 2016. Enter the Pastel 100 Competition! The Pastel 100 competition is sponsored by the Pastel Journal. This online annual competition offers cash, prizes and publicity to its talented winners. Winners will be featured in the April 2016 issue of Pastel Journal! Take a look at what the top five prizes are! And there are 25 more category prizes, plus 70 honorable mentions. Go to the Artist Network's competition page for more information and to sign up. UArt is sponsoriing an online Pastel Competition for which they are now accepting entries. The contest is open and will end on June 30, 2015, at midnight. It will be juried by Liz Haywood Sullivan. Click on UArt 2015 Online Pastel Competition, to find all the contest information including prizes, award notifications, eligibility, requirements, and entry fees. Award winners will be notified on July 21st. There are 1st , 2nd and 3rd place awards, honorable mentions, plus other special awards, all with very nice prizes. Check out the prize list for first place! We are pleased to announce a debut exhibition -- “An Ocean View” -- a juried show of California coastal fine art with an emphasis on the South Bay/Palos Verdes area of Southern California. This exclusive representational show will take place October 16-30 at Riviera UMC, 375 Palos Verdes Blvd., Redondo Beach, California. Artwork will hang in the Ocean View Room and adjoining spaces. Cash prizes for Best of Show, First, Second, Third and Honorable mentions will be awarded at the opening reception to take place Friday, October 16 from 5-7 p.m. The exhibition will be juried by esteemed artist Joseph Mancuso, a master pastelist and oil painter from Southern California. Mancuso is a signature member with the Pastel Society of America, and in 2007 The Pastel Society of the West Coast elected Joe to "Distinguished Pastelist." This is one of the highest honors to achieve as a pastel painter. He is also a member of Oil Painters of America, Laguna Plein Air Painters and The Pastel Society of Southern California. His work has been published in the Pastel Journal’s “The Year’s Best” in 2004, 2005 and 2009. His collectors have included film producer Lawrence Kasden and actor Kevin Nealon. His work has exhibited in the Napa Valley Art Museum and hangs in private collections throughout North America. To enter, go to www.onlinejuriedshows.com and click on Rejoice in Art! “An Ocean View.” Entry deadline is August 19, 2015. Open to all California-based, representational artists in any two-dimensional media, excluding photography. “An Ocean View” is part of Riviera UMC’s Rejoice in Art! Fine Art Fair and Exhibition. For further information, please contact Lynn Attig at lynnattig@verizon.net or visit www.rejoiceinart.com. Download the pdf flyer for the show here. We are excited to invite your members to submit their artwork to our National "Shades of Pastel"
Exhibition to be held this year in Washington, D.C. Our venue, Hill Galleries at the Old Naval Hospital, located on Pennsylvania Avenue in the heart of historic Washington D.C. will provide a stunning backdrop for a show that will showcase the best in pastel painting today. We are excited to have award winning artist Doug Dawson as our juror and judge of awards which will include more than $6,500 in cash and merchandise including $1,500 in cash for the Best In Show Award. The submission period is now open and the deadline for submission is July 15, 2015. For more information and to download our Prospectus please visit our website at www.marylandpastelsociety.com and click on our Workshops and Exhibitions page. The 30th Annual Made in California Juried Exhibition is now accepting entries! Open to all California residents, all mediums welcome! Read about the opportunity to compete for a Solo Show within the exhibition. Download the prospectus here. The 25th Juried Exhibition of the International Association of Pastel Societies will be hosted on the IAPS website. This is an online exhibition only and no work will be shipped. Plus The Maggie Price Award for Excellence $500. ELIGIBILITY: Open to any artist who has an up to date membership with an IAPS Member Society. The entry form, digital image of work to be submitted,and payment of the entry fee must be submitted to OnlineJuriedShows.com no later than October 15, 2014. Please download the IAPS 25th Prospectus for instructions on how to enter the show, important dates, specifications on the artwork, juror information and more.